Giant Killing was my favorite show of 2010 so to say I recommend it heartily is a bit of an understatement. Sadly the series has never gotten a home video release in the states, but that comes as little surprise since it is a sports series. It was streamed by Crunchyroll however during the transition to almost everything being simulcast. I was so excited to see each week’s episode! But now it is being removed from the CR site so I’m watching it again and so should you before November 9th. The soccer isn’t what compelled me so thoroughly. I can’t remember ever watching a match of soccer before Giant Killing. In fact, if anything I’d say the show actually got me curious about the sport as opposed to the other way around. Don’t mistake liking sports anime to being a fan of said sport. It is Giant Killing’s unique perspective shifted from star player or young genius and instead focuses us an ensemble cast with the coach at the center. Everyone involved when it comes to sports from the players to the fans, from the press to the managing staff is a part of this story. Hisui and I wrote an article about that very thing; Giant Killing is about a group of people and how they work together. Giant Killing is a character story that also happens to have really great bouts of soccer. It’s nice to know that there are people who appreciate Giant Killing. 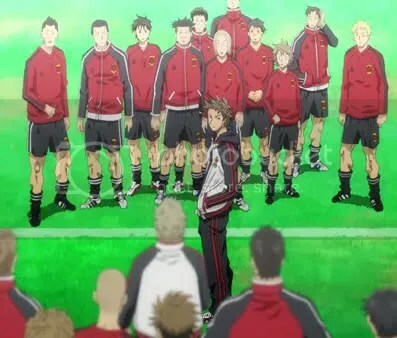 It’s one of the soccer anime series to follow legitimate soccer tricks and not some insane ones with tl;dr names. Yeah. I have totally been meaning to check this out ever since they began streaming it. I think I will finally have to marathon it this weekend. And though Crunchyroll will be taking it down, it is currently, and as far as I know it is going to continue to be, available through Gong on Hulu. I don’t know when Gong added it, but this may be the reason why Crunchyroll has to take it down. Thanks to this post, I gave Giant Killing a second chance and I’m glad I did before the show is taken down. It is a very good show as you saidThank you very much. Now if the manga gets licensed :). One of the highlights of 2010 for me as well. This is how a sports anime should be.